Veterans Day in Loveland means listening for the tolling of the bell that makes its reverent tour of town during the chilly early morning hours. Other celebrations are well attended, and our parade grows each year. 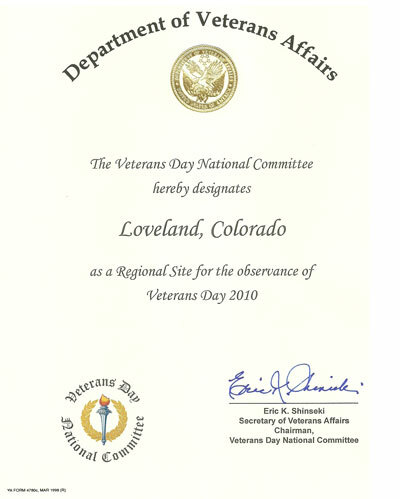 It is a great pleasure to post this letter of recognition from the United States Department of Veterans Affairs, which designates Loveland as a Regional Site for the observance of Veterans Day 2010. Loveland is among a mere 45 cities in the NATION to receive this kind of nod! Many thanks to Tony DuMosch, Veterans Day Chairman and the many Veterans and Volunteers who make this all happen every year. DuMosch says, "This is something Loveland can be proud of because of people like you and me make it happen. Thank you for your support as we gear up for this years 2010 Veterans Day and special tribute to the Korean War era Veterans." 1300: Main hall entertainment with DJ music, Karaoke, & dancing. So watch the paper for listings of this year's Veterans Day activities. If you are interested in taking on an opportunity to volunteer this year on November 11th, contact Tony DuMosch. This entry was posted on Saturday, August 7th, 2010 at 11:26 am	and is filed under Colorado, Loveland, Loveland, Colordo, Veterans Day Parade. You can follow any responses to this entry through the RSS 2.0 feed. You can leave a response, or trackback from your own site.